In early April 1872, Nast presented a careful and prescient parody of illustrator Robert Seymour’s celebrated initial plate to Charles Dickens’ landmark novel, The Posthumous Papers of the Pickwick Club. Better known as The Pickwick Papers, it was initially published in monthly installments from March 1836 through October 1837. 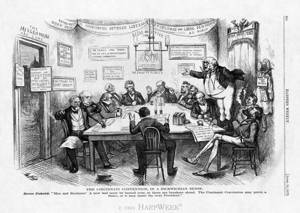 The tale begins as Mr. Samuel Pickwick, Esq., “mounted into the Windsor Chair on which he had previously been seated, and addressed the club himself had founded.” In Nast’s cartoon, Greeley is in the title role of Pickwick, and in place of the individuals represented in Seymour’s steel plate etching, Nast’s Greeley-Pickwick is surrounded by a mixed and presumably ill-matched group of Republican liberals, mavericks, and Democrats, each with his own agenda.